JeffGambler: Card Counting - Is It Legal? You might not know this, but counting cards isn't actually illegal. There is no rule that says you will get arrested if you count cards at a casino, but the casino has the right to ask you to leave if you are suspected of doing so. Anyway, you can prepare yourself for this because pit bosses and floormen will suddenly begin to lurk about if they suspect you - analyzing you and watching your chips stack up. In fact, you shouldn't be surprised if you get booted. It would be your duty to be careful when you count cards, after all. The card-counting concept is quite basic, really, though it is sometimes misunderstood. Casual players seem to think that counting cards involves memorizing every single card that gets played - something that mere mortals would never be able to do. The truth is: counting cards actually merely refers to keeping track of what the deck is composed of and what the not-yet-played cards are by simply keeping track of the low card ratio (cards numbered 2 to 7) to high cards (cards with a value of 10) that already came out. If low cards have been played more compared to 10-value cards, this would mean that there are probably more higher cards left inside the deck. If so, you would have a higher advantage because there is a higher chance of you getting Blackjacks and 20s, as well as other higher hands in general and a higher chance of the dealer busting after hitting for a third card. But how can you keep track of these cards, you might ask. It isn't easy, but with dedication and steady practice in tallying and analyzing the count at casinos, you will be able to do it in no time. Take note that you also have to take distractions into consideration, such as conversations with players, fast dealers, heat from pit bosses and floormen, slot machine noises, and cocktail waitresses. Still, if you practice enough, you can definitely learn how to count cards. 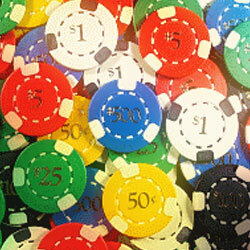 Many players find help in the blackjack chart and suppose it is very useful. You need to keep track of the count with a scale. Cards of high value (Aces and cards with a value of 10) will be worth -1, while cards of low value (cards from numbers 2 to 7) will be worth +1. The cards of middle value (cards of 8 or 9) do not count. So, each time the dealer deals a card of high value, you need to subtract 1 and each time the dealer deals a card of low value, you need to add 1. This is how you get your count. For practicing your skills, you can try blackjack download.